Commercial lighting: Our lighting can make your business a comfortable and attractive place for employees and clients alike! We can provide indoor lights for your office and outdoor lights for your doors and parking lots. Residential lighting: By installing new lighting in your home, you can add extra ambience and create a warm and inviting atmosphere for guests. We offer lights for all types of rooms in your house as well as landscape lighting and lamp posts for your yard. Lighting fixtures: From ceiling fixtures to track lighting, our showrooms boast an extensive variety of fixtures for you to choose from! We can help you find the right lighting fixtures to fit your style and interests. Lamps: Make your room beautiful and eye-catching with the help of our chandeliers and pendant lamps! Our products can suit a wide range of looks from traditional to contemporary. We have what you are looking for! Electrical supplies: We have everything you need to complete an electrical project, including wires, cables, heaters, and many other types of devices. 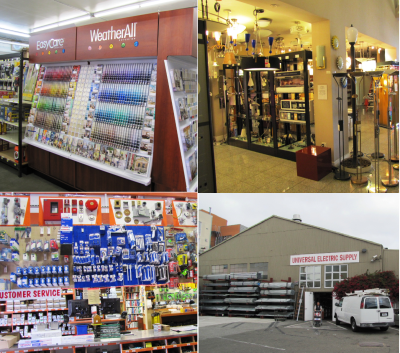 If you are looking for an electrical supply in the Bay Area, we are here to help! Green services and products: Universal Electric Supply Company is proud to be at the forefront of green electrical products. Our lights and fans exceed energy efficiency standards and can help you make a difference in our ecosystem while saving money at the same time. Resources and links: To further assist you in your electrical projects, we’ve provided a list of resources so you can save further money on your electrical services and stay up-to-date on the latest codes and guidelines. We are confident that these services and products can go a long way toward meeting your electrical needs. We invite you to call (415) 621-1888 in San Francisco or (408) 573-7788 in San Jose to learn how we can best serve you!